The earthworks of this Norman motte and bailey castle can be seen on aerial photographs and on the ground. The castle went out of use soon after 1431. A circular ditched motte and a bailey to the south can be seen at the site. There may have been a 12th century stone keep on the motte and a barbican or fortified entranceway between the motte and bailey. These and other features have been identified as earthworks on aerial photographs of the site. Motte and Bailey castle; decayed soon after 1431. Known as Castle Hill or Castle Yards. Circular ditched motte with circular bailey to south. Motte not appreciably higher than bailey bank now. Damaged by ploughing in recent years. 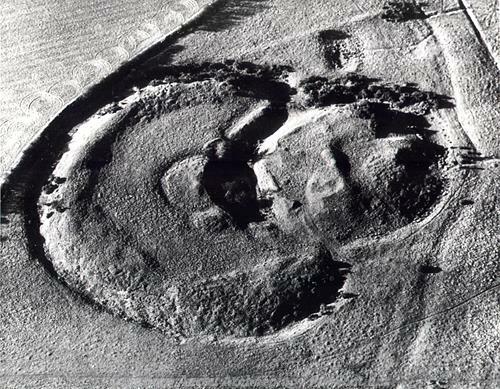 Aerial photographs suggest a stone keep on motte (12th century?) and perhaps barbican between motte and bailey. Some 14th century antiquities found here illustrated in (S1) in the NCM. Rim sherds, probably medieval but perhaps Roman. Detailed examination not undertaken. Whole field including earthworks now under pasture. Bailey bank is in better condition than might be expected after past damage; east side covered only in grass, west side higher and steeper on exterior, with bushes growing on it. An interesting point is why there is a public right of way running up to the south side of the castle and then stopping. Was the site reused? Note also the names 'Black Park' and 'Park Farm' to the north - indicating park of castle? (S5) is based on remarks by M. Knights to Norfolk and Norwich Archaeological Society. Aerial photographs Norfolk and Norwich Aero Club about 1933 to 1938. NAU TG2015E-I taken 17 July 1979 and 4 June 1980 etc. (S5) gives a plan of castle showing it same as now. Castle badly damaged by ploughing. See (S6) and (S7). E. Rose (NAU), 7 May 1987. July 1999. Earthwork survey at 1:1250. Enhancing the Ordnance Survey map. Features internal to the motte include an L-shaped scarp and ridge which suggests part of a building (keep?). The ploughing of the bailey interior has seriously degraded the junction of the bailey ditch with the motte ditch in the east. The small semi-circular ditched enclosure within the bailey, abutting the motte ditch and thought to be a barbican is no longer identified. B. Cushion (NLA), 5 August 1999. Earthworks of motte and bailey clearly visible from the air. Internal circular feature, possibly barbican also showing. (S9) interprets the castle as the Malet's hunting ground - a country retreat on the periphery of their estates - or a castle raised for their tenant Waller of Caen. Section 17 management agreement renewed. See (S10). D. Robertson (NLA), 26th February 2008. Aerial photographs (S11-S25) would indeed suggest a keep structure on the motte, suggested by a sunken area measuring 20m by 12m, centred on TG 2053 1570 and possible barbican between the motte and bailey at TG 2053 1568, which measures a maximum of 35m by 12m. A further possible raised area defined by a ditch is visible (S16 and S20) in the centre of the bailey area at TG 2053 1565. A further sunken area is visible to the north-west of the motte at TG 2048 1572, measuring 25m by 15m, with a possible pond within. E. Bales (NMP), June 2010. --- Aerial Photograph: See file for details of all AP's. --- Aerial Photograph: Edwards, D.A. (NLA). 1998. TG2015/ACF - ACG. --- Aerial Photograph: Edwards, D.A. (NLA). 1995. TG 2015ACH - ACJ. --- Aerial Photograph: Edwards, D.A. (NLA). 1996. TG 2015ACV. --- Monograph: Cushion, B. and Davison, A.. 2003. Earthworks of Norfolk.. East Anglian Archaeology. Vol 104. p 170. --- (No record type): Clarke, R. R. and NCM Staff. 1933-1973. Norwich Castle Museum Record Card - Medieval. Horsford. <S1> Documentary source: Squire Manuscript. <S2> Monograph: Clarke, R. R. 1960. East Anglia. Ancient People and Places. 14. p 233 pl 58. <S3> Article in serial: Barrett-Lennard, T. 1904. Some Account of the Manor or Castle of Horsford. Norfolk Archaeology. Vol XV pp 267-292. <S5> Newspaper Article: 1971. Norwich Mercury. 24 November. <S6> Newspaper Article: 1987. Eastern Daily Press. 7 May. <S7> Photograph: Wade-Martins, P.. 1987. Ploughing at Horsford Castle, 1987..
<S8> Unpublished document: Cushion, B. (NLA). Earthwork Survey. <S9> Monograph: Liddiard, R.. 2000. Landscapes of lordship: Norman castles and the countryside in medieval Norfolk, 1066-1200.. pp 35-36, 85-88. <S10> Unpublished document: Norfolk County Council. 2007-2008. Section 17 Management Agreement. <S11> Vertical Aerial Photograph: USAAF. 1944. US/7PH/GP/LOC 264 5041-2 31-MAR-1944 (NMR). <S12> Vertical Aerial Photograph: RAF. 1942. RAF HLA/470 53-4 11-APR-1942 (NMR). <S13> Vertical Aerial Photograph: RAF. 1945. RAF 106G/LA/191 7093-4 22-MAR-1945 (NMR). <S14> Vertical Aerial Photograph: RAF. 1946. RAF 106G/UK/1636 4191-2 09-JUL-1946 (NMR). <S15> Vertical Aerial Photograph: 1950. RAF 541/T/35 4042-3 08-OCT-1950 (NMR). <S16> Oblique Aerial Photograph: CUCAP. 1954. NMR TG 2015/5-8 (CUCAP 8171/79-82) 23-JUN-1954. <S17> Vertical Aerial Photograph: RAF. 1954. RAF 82/1030 (F21) 0031-2 29-SEPT-1954 (NMR). <S18> Vertical Aerial Photograph: RAF. 1954. RAF 542/60 (F22) 0018-9 11-OCT-1954 (NMR). <S19> Vertical Aerial Photograph: RAF. 1955. RAF 540/1723 (F21) 0118-9 04-OCT-1955 (NMR). <S20> Vertical Aerial Photograph: CUCAP. 1966. CUCAP (AQK23-4) 30-DEC-1966. <S21> Vertical Aerial Photograph: Ordnance Survey. 1969. OS/69252 239-4013-JUN-1969 (NMR). <S22> Vertical Aerial Photograph: Meridian Airmaps Limited. 1971. MAL 71020 061-2 11-APR-1971 (NMR). <S23> Vertical Aerial Photograph: Ordnance Survey. 1990. OS/90224 135-6 31-JUL-1990 (NMR). <S23> Oblique Aerial Photograph: Edwards, D, NLA. 1979. NHER TG 2015A-B (NLA 73/AMT5-6) 17-JUL-1979. <S25> Vertical Aerial Photograph: Ordnance Survey. 1992. OS/92337 156 11-JUN-1992 (NAPL). <S26> Vertical Aerial Photograph: Ordnance Survey. 1998. OS/98041 47-8 31-MAR-1998 (NMR). <S27> Article in serial: Gurney, D. and Penn, K. (eds). 2000. Excavations and Surveys in Norfolk 1999. Norfolk Archaeology. XLIII Pt III pp 521-543. p 528.